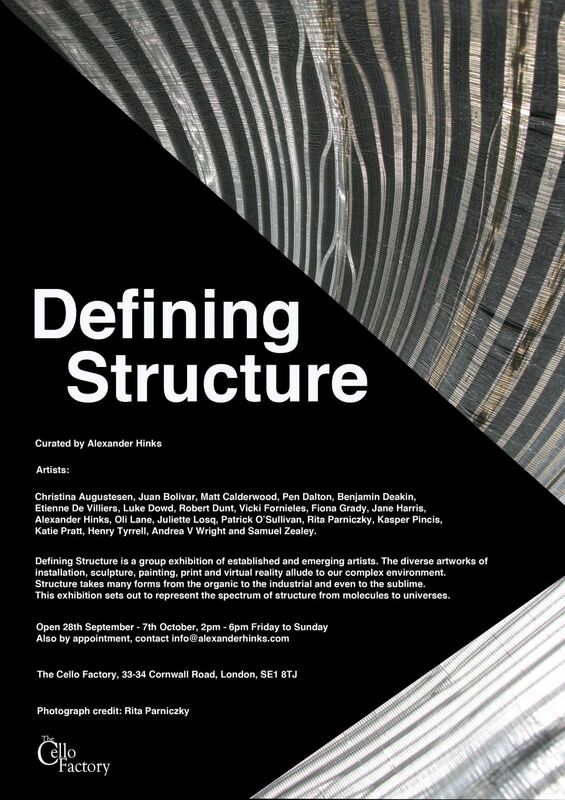 Defining structure is a group exhibition of established and emerging artists. The diverse artworks of installation, sculpture, painting, print and virtual reality allude to our complex environment. Structure takes many forms from the organic to the industrial and even to the sublime. The exhibition sets out to represent the spectrum of structure from molecules to universes. Christina Augustesen, Juan Bolivar, Matt Calderwood, Pen Dalton, Benjamin Deakin, Etienne De Villiers, Luke Dowd, Robert Dunt, Vicki Fornieles, Fiona Grady, Jane Harris, Alexander Hinks, Oli Lane, Juliette Losq, Patrick O’Sullivan, Rita Parniczky, Kasper Pincis, Katie Pratt, Henry Tyrrel, Andrea V Wright and Samuel Zealey.